If WordPress allows you to customize almost any feature, to tailor-make a website according to your detailed preferences, why leave the login page be. The login page provided by default, is definitely disconnected from the rest of your site. So how about revamping it up a bit? This tutorial will provide you a basic guide to change the logo on the login page, the background color, and tweak the login form styling a bit. For the changes, you would have to add some code in your theme’s (or child theme’s) functions.php file, and add the styling in a custom stylesheet. So let’s continue. where ‘customlogo.png’, is a logo of your site, and is uploaded in the images folder of your current theme. The dimensions set should be as per your site’s logo. You can adjust additional properties such as padding, margin, overflow, etc. The form fields text can be customized using ‘label’ class. To change the login button, you would have to override the ‘button-primary’ class. Now the background color is, let’s face it, boring. So how about changing it too? And besides, this is probably the easiest to change, on your login page. Just override the ‘login’ class’ background property. So you have changes most of the things, why leave out the url? To change the login url from yoursite.com/wp-login to yoursite.com/login/, use a plugin, Better WP Security to help you. That’s all for this article. Most web designers would not bother customizing the WordPress login page, but we feel it is important to style it, to maintain a continuity with the rest of the theme. 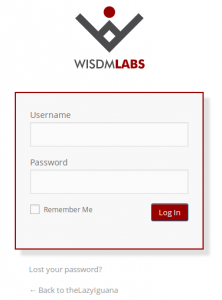 What are some tips you have used to customize your login page? Are there any you would like to share with us?